Supplements, snacks, pills, and liquid—all in the same bottle. Featuring the BlenderBall® wire whisk and unique Twist n’ Lock™ containers, the Precision Engineered BlenderBottle® ProStak® is the all-in-one solution for the serious athlete. Say 'goodbye' to lumpy protein shakes and 'hello' to smooth, great-tasting drinks. Our patented mixing system uses the BlenderBall® wire whisk—found only in BlenderBottle® brand shaker cups—to mix even the thickest ingredients as you shake. Integrated with the StayOpen™ flip cap, the adjustable carry loop lets you hold more when your hands are full and offers a convenient place to attach keys while at the gym. Made from only the highest-quality materials, BlenderBottle® brand shaker cups are—and always have been—BPA and Phthalate free. The ProStak’s unique interlocking jars have individual lids, making it possible to carry supplements, snacks, and more—with or without the bottle. With a quarter turn, the Twist n’ Lock™ jars can be quickly attached or detached from the bottle. The covert pill tray locks into any jar lid, allowing you to carry pills and powders in the same jar. 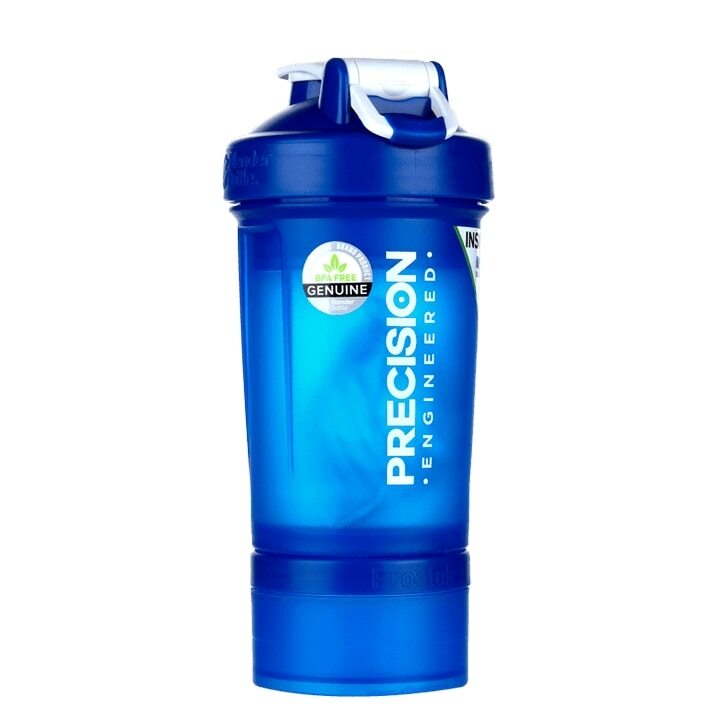 Precision Engineered Pro-Stak Shaker Cup is rated 5.0 out of 5 by 9. Rated 5 out of 5 by yiannis13 from The best quality shaker on the market! I bought this shaker a couple years ago for mixing up my protein but the bottle ended up being my everyday water bottle. The quality of the plastic is many times above anything else on the market and you can feel the quality every time you are holing it. The additional compartments are amazing for shaving protein powder and vitamin pills. However last week it dropped from my hands full of water and I managed to break it. Tomorrow I will be on my way to my local H&B to replace it. Rated 5 out of 5 by Inyka from Great. shaker The shaker looks great and it has 3 storage boxes, to store whatever you need with. Really recommend it.